If there’s one result that sums up the crazy, unpredictable end to this Premier League season, it’s Chelsea’s 2-1 defeat at home to Sunderland. That was Jose Mourinho’s first home league defeat as Chelsea manager, after 78 games, and proved crucial at both top and bottom. Chelsea’s chances of winning the league title took a huge blow, while Sunderland continued their great escape. However, to a certain extent that result was typical of their campaigns, because Chelsea and Sunderland are the two sides in the division that have collected more points against top half sides, than against bottom half sides. Indeed, while that 2-1 Sunderland victory was a huge surprise, it’s epitomised both clubs’ seasons. Chelsea have been excellent against the top four, beating Liverpool twice, Manchester City twice and winning 6-0 and drawing 0-0 against Arsenal. But they’ve struggled to break down weaker sides, as recent defeats against Aston Villa and Crystal Palace show – last week’s goalless draw against Norwich is another example. Sunderland, meanwhile, also managed to take a point against Manchester City in their recent run, and won at Old Trafford (even if that’s less difficult than in previous seasons). They also got past Chelsea and Manchester United in the League Cup, caused Manchester City problems in the final, as well as collecting wins against Manchester City and Everton in the league. Their record against the three relegated clubs, however, is just two wins from six matches. Here’s a graph showing each of the 20 sides’ points-per-game record against the top and bottom halves this season. Obviously, there’s still one game remaining, but it makes for interesting reading. The red dotted line depicts the position a side would be if they collected exactly the same PPG against top and bottom half sides – Sunderland and Chelsea are the only sides below it. Perhaps the most striking thing is the similarity between so many clubs – the majority of the division collects between 1 and 2 points against bottom-half clubs, and between 0.5 and 1 points against top-half clubs. In this respect, Sunderland are a world of their own amongst the non-top 7 clubs. It also demonstrates which sides are ‘flat-track bullies’ – the teams towards the upper-left of the diagram. Manchester United, for example, have been better at battering bottom-half sides than Liverpool, somewhat surprisingly. However, their record against other top-half sides is worse than Stoke or West Brom (who, incidentally, have both beaten United this season, which has helped their record). Arsenal are also notable in this respect, while Crystal Palace also have a huge disparity. 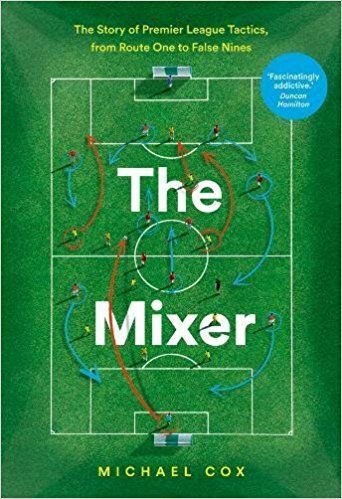 The Premier League is increasingly split into two sections – some teams challenging for Europe, the rest fighting relegation, and no real ‘midtable’ to speak of. Also, as sides become increasingly organised and the emphasis upon tactics becomes much greater, playing against one of the Premier League’s better sides is often a completely different challenge from playing against a relegation battler, as Chelsea’s season suggests. A top half v bottom half graph can reveal a great deal about the nature of teams’ play. Nice article, and your plot illustrates the point well. However, it is misleading to plot these data with different scales on each axis. It exaggerates the importance of beating sides in the top half (moving Chelsea, Man City, Liverpool etc further away from the other teams) and under plays the importance of beating teams in the bottom half (placing Arsenal and Man Utd closer to the other teams). Please re-plot this with same length scale on each axis so that the plot is square. The graph is very nice and all but I fail to see what this shows us beyond what was clear to anyone who was following the season. It would’ve been great if something surprising was thrown up by the data but it wasn’t. Better than nothing but not by much. It’s interesting that it’s easy to loop an ellipse around the (presumed) top six, whereas the bottom three aren’t so distinct. 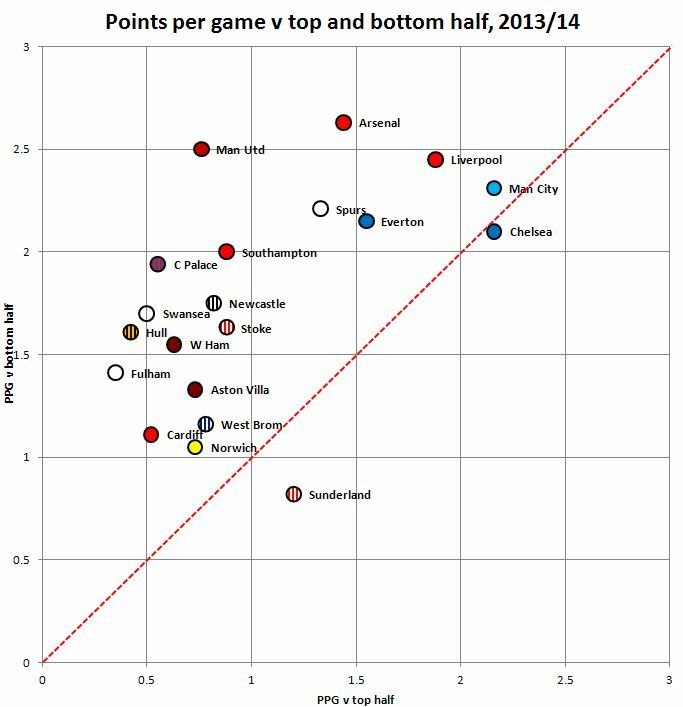 As you say, the two outliers have been ManU and Sunderland. Forgive me for commenting on my own comment, but looking at the (presumed) top six, it occurs to me that from what I’ve seen on the highlights, it’s numbers one and two who have had the weakest two goalkeepers this season. They’ve really needed to score a lot, ManC and Liverpool! And three and four have the keepers who shared the Golden Gloves if I’m not mistaken. What an insightful and creative article: I believe that this shows how consistent Man City has been throughout the league. Also, it provides an interesting revelation of Arsenal and Man Utd’s mediocrity this campaign, seeing as they were not very successful against top tier teams. Still, lovely article. I would love to read more from you. It’s obviously more than a bit simplistic to say managers are more responsible for tough, tactically oriented games and the quality of your players more directly correlating to beating weaker teams that park the bus, but I’m not sure it’s wrong either. This is why I think Chelsea should be favorites next year, assuming they handle their transfer business well and get a left-footed LB who can give Hazard a bit more room (and let Azpilicueta provide width on the right), a CM to pair with Matic who can pass the ball and a striker, be it Lukaku or a high-priced type. You prescribed similar things in an article elsewhere, but was suprised you went with Carvalho as the CM option, when Matic’s strength and Oscar’s solid defensive work would seem to allow for a more creative option in the form of someone like Kroos, Pogba, Koke, Herrera or whoever you like. Point is, they’ll still have Mourinho to get them results against good teams, and they surely have to beat weaker teams at a higher rate without the hands tied behind their back that were their limited fullbacks, complete lack of creative distribution in midfield and striker play (especially away from home, since Etoo did score at a good rate at Stamford Bridge). “their limited fullbacks”: but doesn’t the manager limit them by (sometimes) instructing them not to cross the half-way line? Man, you are doing such an amazing job. Always reading this website. Just want to say thank you from Russia. This is very interesting. Although I’d like to point out that if my maths and guesswork from your graph is right, if Chelsea beat Cardiff at the weekend, that brings there points tally against bottom teams up to about the same as the top teams (around 2.2ish in both cases? ), placing them on the line. Very interesting graphic. It goes a long way in demonstrating just how close the season was, and how little separated the top three. Man City’s lead over Chelsea was just that tiny gap in results against top teams (2.3 vs 2.1?) — against the lower tier they are dead even! That also reveals the ultimate quality gap between them and Liverpool, who appear to have piled on the weaker teams but couldn’t maintain those results against the better teams. Looks like Chelsea will have to start playing some positive football. All that talent and still can’t manage it. Another assumption from this diagram. Arsenal is the best team against bottom-half sides, but they are just terrible versus the top-half ones. Maybe can be interesting make a regression line to show the slope of the points gained along this session, after that, we can continue with a little linear model analysis where we could check if there are signifficance between the variables. You can clearly see the two groups formed, one with the top 7 teams, the other with the bottom 13. Looking at the table even very early on you could see that forming, even with decent form of Southampton and Newcastle before Xmas. Wonder how it’ll look next season; I predict an even bigger gulf..
Great article, but the only thing i would ask is how are you plotting these teams? Are you basing it on the league position the oppositions currently hold today or position they were in and points gained a the time of playing during the season? If its the former of the two methods then i wonder how the graph would look if it was plotted by points per game against top/bottom half taking the standing of the opposition on the day before they played during the whole season? Chelski lost the title because they are defending team and scoring from counterattacks. Low teams just park the bus and you cant defeat park the bus by park the bus. Mourinho had the same problem with Real Madrid during his third season. Everyone knew how he played so noone left him to counterattack so he lost his tittle during first matches and was moaning about Casillas. The funny part is that he was outsmarted by low teams managers in his first season in Chelski and it will be even worst in the second. He cant play an attacking footbal and cant break his own tactic. 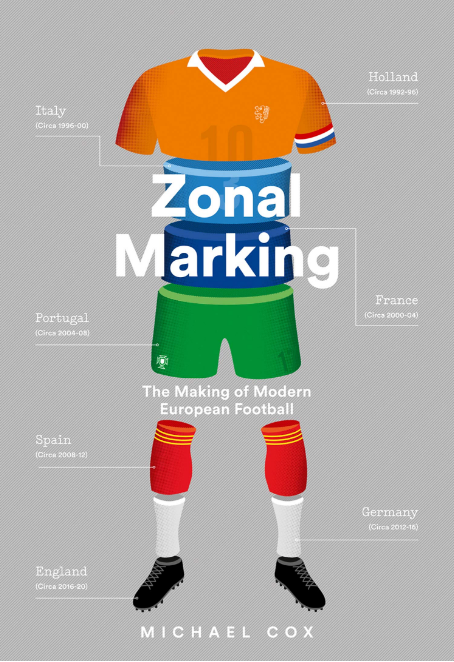 I am looking forward to hear more stories about the 19th century football. Isn’t this site for people that actually love the game? You may leave. Mourinho is playing the most complex of games. Controling zones, it’s a beauty. there are 3 good games this week .